OSJC's sprite work injects two-dimensional renderings of familiar accouterments that replace most of Heretic's pickups. There's a like for like weapon replacement thing that drives most of Heresy's gameplay. There are a number of problems that result from the switch-ups, but a lot of this can be conquered with a little bit of survival style gameplay and a practiced knowledge of the secrets of whatever map you're in. It helps that the axe is such a formidable replacement for the staff, because the gauntlets have been overwritten with the grenade launcher. While cool, it's no replacement for activating the Tome of Power and sucking away the life from D'Sparil's minions. There's also a secondary mighty foot-style alt-fire that can assist with pushing your foes back to give you some breathing room. I think that the pushback makes it even better for killing trash enemies than the axe. One of the main problems is Quake's weapon system replacing the vibrant if ineffectual cast of Heretic. I don't mind the shotgun taking over the Elven wand slot. It's much faster to slay monsters with, even if it can take anywhere from two to four shots to kill a golem. Slot 3 is the super shotgun, though, which is basically a flat upgrade. Granted, it's way more satisfying to shoot than the ethereal crossbow, and few if any players really enjoy having to switch back to the wand when forced to. For whatever reason, Heresy's early game feels kind of tight on ammo, though some polite feedback led to a nice little stimpack in the form of gargoyles having a chance to drop shells, which is just the shot in the arm you need to get past that early slump. Once you get the ball rolling with a nailgun pickup or a quad damage, you're set. Because the Dragon Claw and the Hellstaff have distinct niches, the Slot 4 / 5 nailgun / super nailgun swap is felt more than most. I can see going back to using the Nailgun after obtaining the SNG for ammo conservation, but the SNG is what you need for regularly dispatching opponents at ludicrous speed. Getting either weapon is a defining moment because it gets you out of diligently shotgunning monsters to death. I suppose that, if nothing else, the regular nailgun has bouncy projectiles if you're afraid of facing Heretic's beasties head on or just can't aim. The SNG conversely fires ripper nails when it's been boosted with the quad damage. EDIT 05/30/15: Actually, the SNG fires ripper nails 50% of the time, regardless of whether it's boosted! Slots 6, as I mentioned, is the grenade launcher. It's a major change as it replaces the gauntlets, which are one of the handiest items you can get in the original game, for a variety of reasons. The gun itself behaves exactly like you'd expect it to, except the splash radius feels a lot larger than I thought it'd be, so be careful when you're messing around with it. For those unfamiliar with Quake, the grenades bounce until they run out of kinetic energy or collide with a monster (or you). As an additional precaution, be sure to turn off autoaim, unless you don't want any control over your grenade trajectory when you're facing a monster. 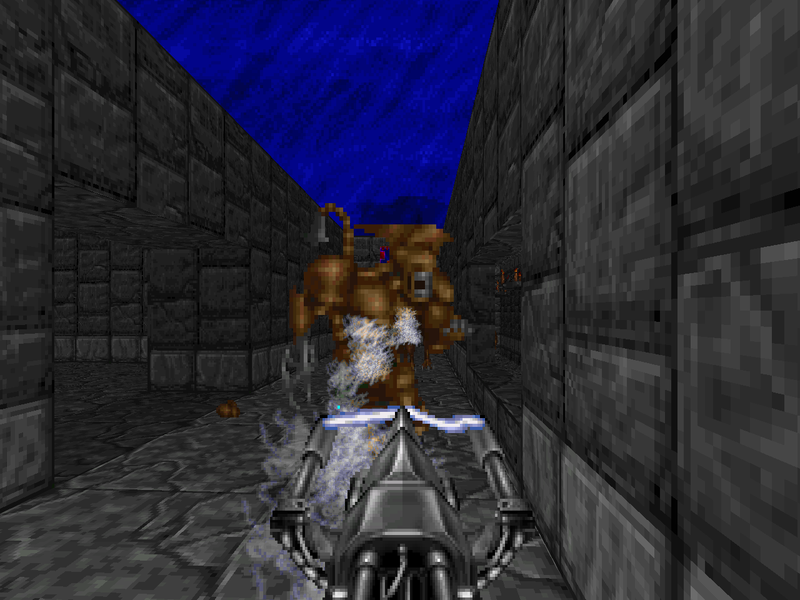 The rocket launcher, in slot 7, is way more satisfying to use than the phoenix rod; you wield a surprising amount of authority and Heretic's enemies are just more fun to shoot than Quake's since they get knocked around like rag dolls as opposed to those static, drawn-out death animations of Shub-Niggurath's offspring. The Thunderbolt replaces the firemace and occupies slot 8. 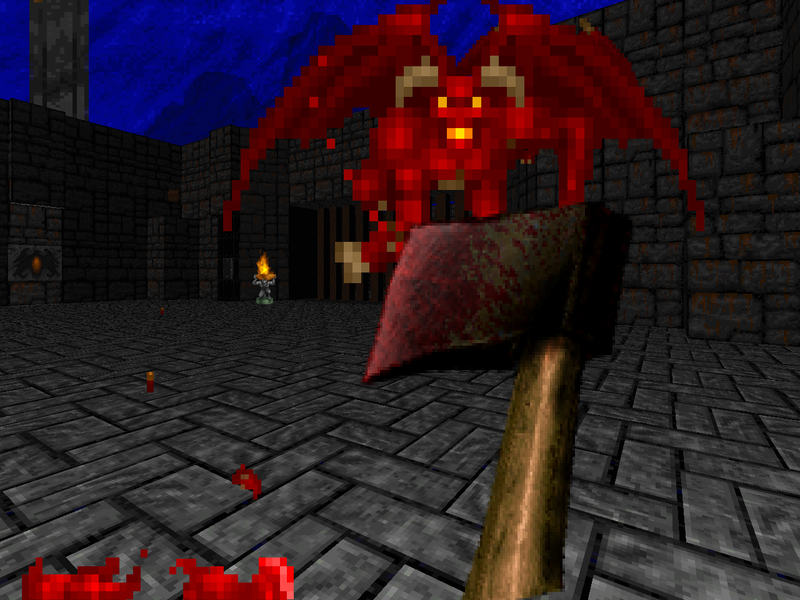 I can't say I mind, since the firemace feels like one of the least useful weapons from Heretic. Now, most of Heresy's weapons will auto-aim, but the Thunderbolt will NOT. It also has some pretty nasty kickback, so it'll take a bit of effort to master, should you happen to come across it. Like the mace, it's not guaranteed to show up during normal play. It's a shame that the Quake weapon set doesn't have more variety, which is no fault of OSJC's. The Thunderbolt is a cool weapon and stashing it behind a 75% chance potentially robs a significant source of variety. Many of the pickups have had their sprites changed, but only one of them has had any alterations in functionality. They all look like their Quake counterparts, with boxes of shells, nine-inch-nails, rockets, and cells. The mask of shadows becomes the ring of shadows; the mystic urn becomes the megahealth; silver and raven shields yellow and red armor. The only real difference is the quad damage, which replaces the Tome of Power. If you didn't know, the quad damage just straight up multiplies the damage you do by four. While it's not as mechanically interesting as the before and after effects of the tome, its efficacy cannot be denied, especially when you're rocking the super nailgun or Thunderbolt. The monsters are basically the same. There's the included Nash Gore mod as well as neat effects like wrappings flying off the golems / mummies and bone splinters flying off the undead knights. They all behave the same, but there is a random chance to get a palette-swapped dark bishop instead of a disciple of D'Sparil. It's a neat Easter egg-type feature and the two aren't much different, so the firing patterns have a better chance of catching you off-guard. I also found out while playing this mod that Maulotaurs are invulnerable while executing their charge attack, something I hadn't realized given how rarely you get to see them bleed with all of Heretic's vibrant hit effects. Besides Nash Gore, DIH comes bundled with several supplemental packages which you can load at your own discretion. One is a bundle of independently-selected texture replacements that gives Heretic more of a Quake flavor with an addon by the mod author to fix some issues, which includes a selection of new, purple-clouded multi-layered skies. 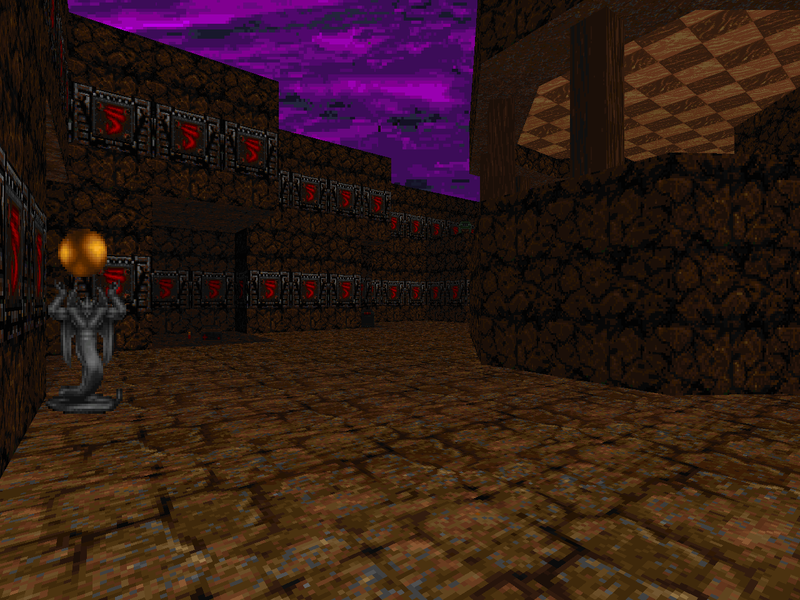 There's also a sky pack explicitly for use with GZDoom, if that's your thing. I could take or leave the texture replacements. Heretic is largely about the contrast of stone and wood set against the color of the sky. The texture pack paves over most of the stone with Quake's brown, which may be more appealing to players who are using this weapon pack for the sake of Quake, but is more of a miss for me. That's disregarding the way that some of the replacements tile, which leaves sections of levels with that awkward wallpaper feel of novice Doom maps. All that aside, the replacements are entirely optional, and they do look better in GZDoom, picking up an inexplicable greenish tint. I also dig that ripple effect added to E3's underwater dome. The only awkward bit is how often it seems that enemies are left with a sliver of health when you're using the shotgun and super shotgun. Quake's shotgun damage just feels more... predictable. You may just have to resign yourself to finishing off the lesser creatures with the axe until you build up some momentum / pick up a nailgun. I'm also not too sure about replacing the gauntlets with the grenade launcher, but Quake doesn't have a chainsaw analogue to fit in there, and I don't know what you would do with the grenade launcher apart from spawning it alongside the rocket launcher. One nice twist is another optional addon, 4BSHOT, that makes the super shotgun less of a bore against tougher opponents by allowing you to dual-wield them for super-super firepower. Not that the super nailgun won't be more than enough. In any case, it's cool to get a run at Heretic with a more... POWERFUL weapon set, and there are plenty of frills to elevate this above a pure gameplay mod. 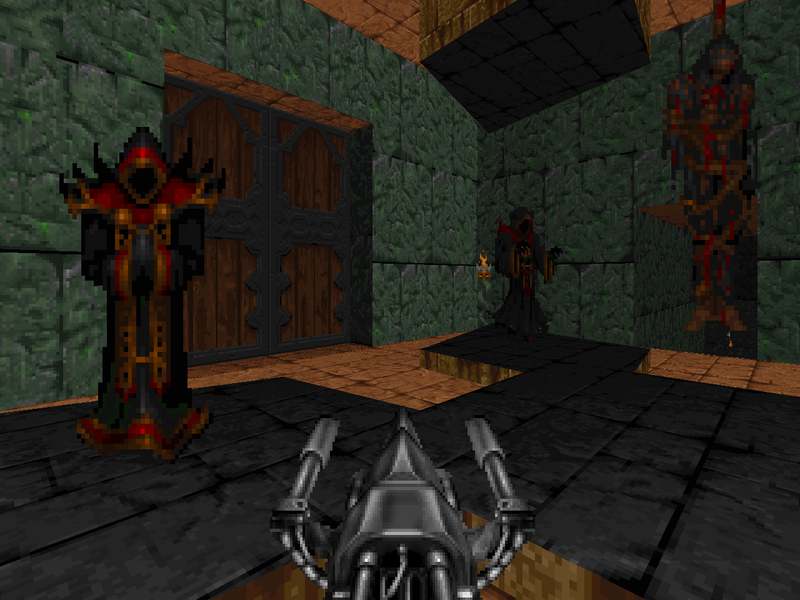 If the idea of Quake weapons in Heretic's universe doesn't offend you, then Descent Into Heresy might be right up your alley. 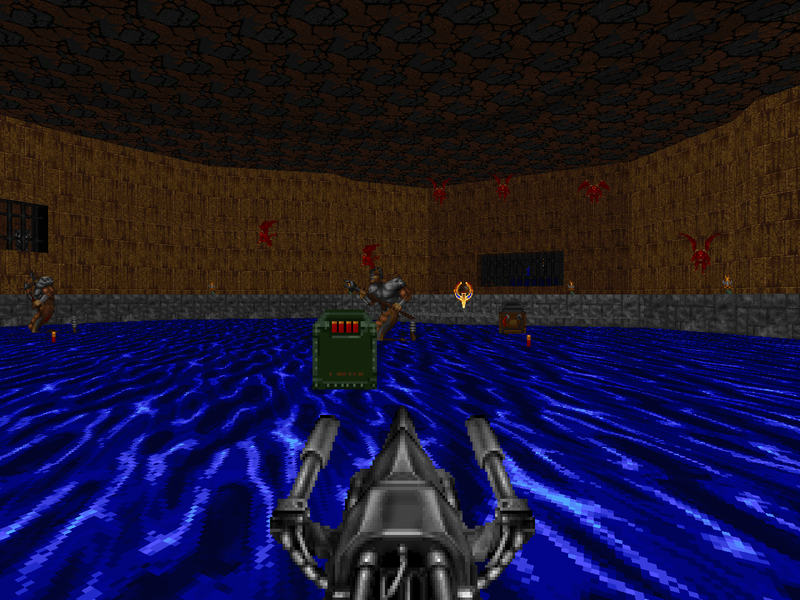 Perhaps, one day, we'll get a fully Doom II-ified sprite set of Quake monsters to go along with it! Are yoy ignoring me or something? Will you write a review on Beta Labs? No I am not ignoring you. But in spite of what it may look like, writing about doom is a hobby of mine, not a full-time job. and i don't want it to feel like a job again, because that is when i will quit and give all this time to my family instead. so if it seems like i am taking a long time to get back to you or anyone else for that matter, it's because im taking my sweet time. Im not on demand. Sure, I will look at beta labs when I get around to it. You owe nothing to me, and you're not obliged to report me. I was just confused for a while, becayse you did not respond to my message. At first, I thought that you haven't received it, or haven't read, but then I thought that you're ignoring me for some reason. If you would have told me "I won't write a review", or "I'll write it later", I would've understood. tho it's not as obvious compared to the main indicies. this goes for pretty much anyone who has a question about the blog. blogger's comment interface doesn't group comments in places where they can be hidden; all i have is a huge list of nearly 1500 comments (nearly half of which are my replies, lol) and the most recent comments are at the very top. sorry for shouting. i will get around to it later. same with uac secret. well, paranoid demanding comments aside, I must say many many thanks for writing this review. its honest and kind and its clear you completely get what it is I was trying to achieve with this. thanks for understanding the grief I had balancing the weapon/monster/ammo/item issues that occur with these type of mods and for not being overly harsh regarding these things: like the grenade launcher/gauntlet replacement thing. Its an honour to be on this blog and I'm over the moon to be on here! - the sng actually has a 50/50 chance of firing rippernails all the time, quaddamage or not. 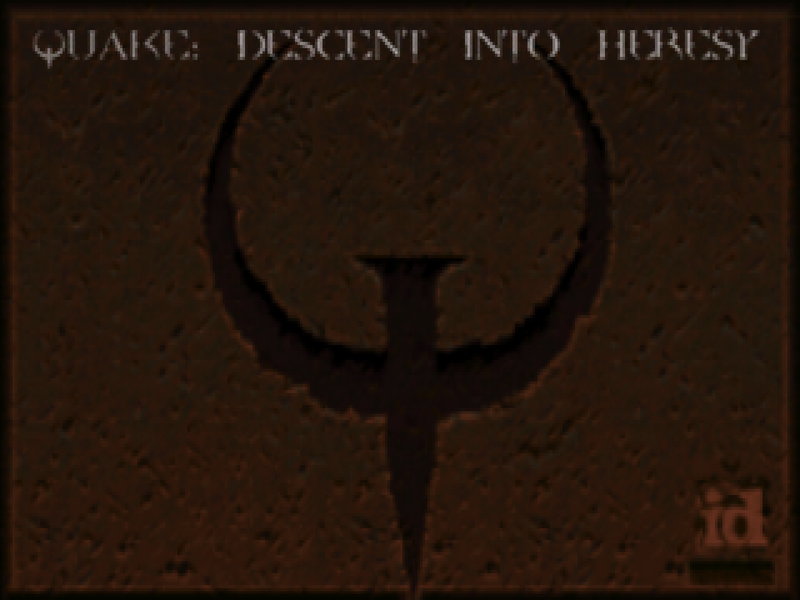 Quake and Heretic fused together? I'll give it a shot. Been playing Masters of Chaos bout a thousand times waiting for another Heretic mod. Looks neat though. another mapset like Masters of Chaos would be phenomenal. Yes sir! I guess we just have to wait huh?